What’s so interesting about translation? It’s just a process. Instrumental. For countless people, it’s an aspect of the everyday so habituated as to seem subconscious (half of Vancouver, for example, speaks the official language—as declared by the municipal government—as a second language; in London, 250 languages are spoken). Perhaps it gets a bit more interesting when, as we see increasingly in popular culture, translation serves as a source of fascination with cultural relativism or a comfortable zone for humour in stereotypes (consider HSBC’s cross-cultural advertising campaign Different Points of Value or Sofia Coppola’s widely viewed film Lost in Translation). But whereas from these vantage points translation is readily accepted as a natural consequence of globalism, Translation Services works to address the subject as a beguiling, contentious space for abstraction and emergent cultural production. As a curatorial effort, the project brings three exhibitions together in series to chart a space in which translation reveals levers of cultural power, the autonomy of objects and the potential for creative liberation through subversion. Translation is derived from the Latin translatio, meaning “to carry across/to transport.” This etymology implies a bridge or a journey, and it therefore also connotes the potential for something to be lost along the way. The road from original expression to translation is a windy one (or, perhaps more accurate to the present day, produces some jetlag). This way of thinking about translation has become widely understood and is a telling measure of our current moment in globalization. We assume more readily than we used to that translation is a paradoxically conflicted project; it aids communication, but it also inevitably obscures some measure of meaning. But this is not how we want to think of translation. At the root of this understanding of translation is a lurking essentialism that invokes privilege. Philosopher Boris Buden clearly sets up this traditional theory, which “understands translation as a binary phenomenon: there are always two elements of a translating process, an original text in one language and its secondary production in some other language. It is therefore its relation to the original, which decisively determines every translation.”1 Buden reminds us that Walter Benjamin’s punctuating essay The Task of the Translator changed all of this. For Benjamin, each translation was better understood as a tangent: a situation in which the new product is only connected to the original at a single point. From that point, the tangent comes to occupy new territory entirely. Buden celebrates that “neither the original nor the translation, neither the language of the original nor the language of the translation are fixed and enduring categories. They do not have an essential quality and are constantly transformed in space and time.” We like this idea too. Translation Services thus operates more in the context of what is known as “cultural translation,” a theoretical territory mapped out by Homi Babha as a “third space” where hybridity, transgression and—most importantly—emergence can occur. This is a space where lines can be drawn between aspects of cultures without locking any of the actors into a particular subject or object position (and thus, into or out of certain terms of discussion), but it is also substantial enough to avoid relativistic dissolution and to allow for meaningful communicative exchanges to take place (as cryptic as these may turn out to be). This space, unique to cultural theorists following Benjamin, is more familiar to artists. Aesthetic translation, as representation, was long the method of art. But just as the traditional theory of translation no longer suffices, just as representation no longer serves as a reliable conduit for art experience, artists now translate differently than they once did. We enjoy, seemingly against the grain, Bourriaud’s proposition that artists are now “contemporary travellers who traverse a cultural landscape saturated with signs, creating new pathways between multiple formats of expression and communication,” and who wander “in the era of universal subtitling, of generalized dubbing.”2 In our view, the pervasive ambiguity of art language—using uniquely emergent methodologies— can provide a more accurate image of the evolutionary trajectory of language and culture than a single text for translation ever could. Emergence through translation was on display in the children’s workshop Language Kitchen, developed with Jessica Jang, and which launched the Translation Servicesproject. At this event a group of international students aged 9-12, visiting Vancouver from abroad, began by exploring the various origins of their given names (several have as many as four). Later in the workshop the children were encouraged to create a range of new cuisines and to invent the cultures that surround them, all in the spirit of “cooking up” language. An indicative sign of the children’s instinctive view of culture could be seen in the most popular method developed to eat the different foods they created: when the presenting group threw the dish in the air so that participants could catch whatever they might in their mouths—a suitable metaphor for children digesting a world of language. Translation Services considers three art practices that each, in part, explores different aspects of translation: Description for Other Things by Ryu Hankil, What difference between me and you? by Jarrod Sanderson and Please Translate by Andrea Francke and Jackson Lam. In the performative sound piece Description for Other Things by Ryu Hankil, objects are tasked with—rather than a task for—translation. Ryu uses an old-fashioned typewriter to record reflective notes about his own hybrid practice as publisher, designer, improvisational musician and performance and sound artist. As the artist types these descriptions and musings, the typewriter—which is connected to a range of objects—transmutes the vibrations from the act of typing into sound. The result is a sort of reverse experience of transcription, with the objects “translating” the notes about the artist’s practice. Whereas Ryu’s experiments reverse the historical role of aesthetic translation through representation, Jarrod Sanderson’s What difference between me and you? amplifies the traditional understanding of translation to an absurd degree so that it must be called into question. In this short film, Sanderson interviews international art students in the UK, systematically correcting every occurrence of an error in grammar and pronunciation in the responses he receives. The result is grueling and disturbing, working against the grain of political correctness, appearing to shore up the tyranny of the “original” tongue. With time, however, the brutishness gives way to an absurdist conjuring of dark humour. 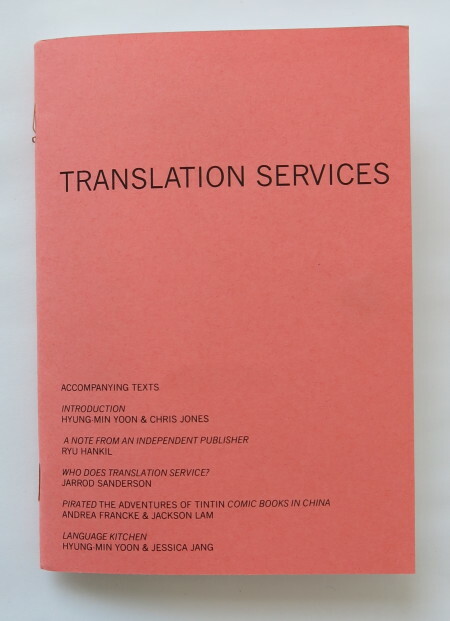 The third piece exhibited in Translation Services derives from The Piracy Project, a collaboration between Andrea Francke and AND Publishing, based in London. Francke’s contribution Please Translate continues her ongoing interest in the creative and even subversive potential of the global market in pirated books. Francke and designer Jackson Lam were inspired by unauthorized translations of TinTin in Tibet (titled TinTin and the Mysterious Snowman), which was subsequently published by Chinese authorities as TinTin in China’s Tibet. Drawing on the 1960’s history of London’s thriving pirate press, Please Translate transforms the gallery into an autonomous space for the viewer to enact free speech. The last component of Translation Services is this publication that you are reading. We have noted in the course of its writing that the process of translation continues still. For me, Min, the curatorial effort was rooted in an abstract language of associations set in a shifting array of ideas. Each art practice is integral to itself (an original) and so my own engagement with the works has seemed tangential in the Benjaminian sense. For me, Chris, writing this was a dialogic process rooted in our discussions of the work and the inertia of a monolithic mother tongue. The real work is somewhere in between all of this (or rather, it was). The exhibition may already have passed, in which case these words are a translation of a different sort.